No more diapers. 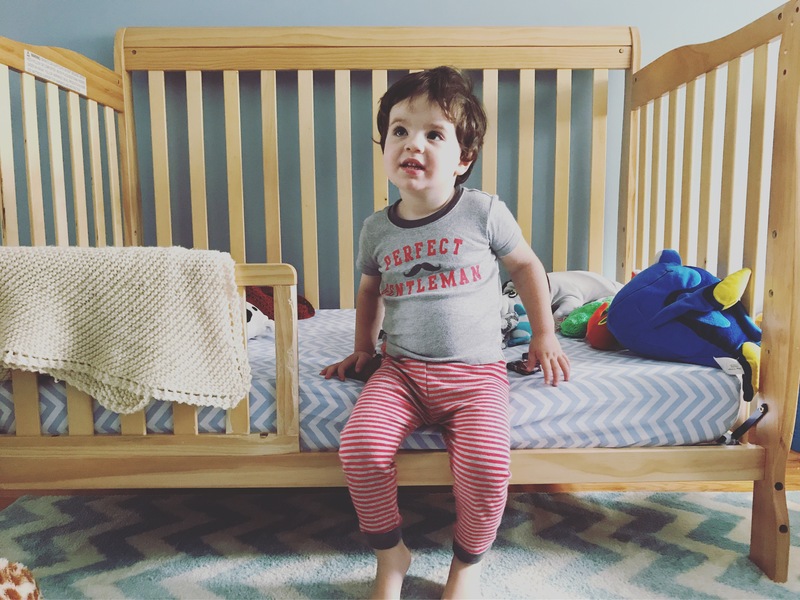 Trying to get you into your diapers multiple times an evening–because inevitably you have to use the potty at some point after we’ve finally wrangled you into a diaper but before you climb into bed–was like trying to get one of our grumpy cats into a diaper. It just wasn’t worth it anymore, so we made an executive decision that you’ll be wearing Pull-Ups only from here on out. I thought you’d fight this, but instead you’re so proud of wearing Pull-Ups that you’re telling everyone you know about it. No more milk before bed. I’m super tired of cleaning up your spilled milk, and I’m fairly close to crying over it. So you get milk with dinner–you can drink as much of it as you’d like while you’re at the table–and it doesn’t come upstairs. After all, only babies need milk before bed, and you’re not a baby anymore. You’re a big boy. You must be bed-ready before getting either TV (on rare occasions) or a book. TV is an extra-special treat for extra-good behavior. It’s not a given. You can read a book (or two or three, depending on the length and depending on the amount of time we have) before your bedtime cuddles. But you can only do this if you’re in your PJs and have brushed your teeth. So it behooves you to cooperate through those processes to allow time for reading or watching. And because we have big-boy expectations of you at bedtime, we thought it was fitting that you should have a big-boy bed. We weren’t terribly concerned about the transition from crib to open bed. At Nonna’s, you’ve been sleeping on an inflatable big-boy mattress (that is, a bed without bars) for some time, and you don’t have issues staying in it. So yesterday, Daddy went up to the attic to haul down the toddler bed railing we’ve been saving since before you were born for this very moment. We tried it out for the first time during your afternoon nap yesterday. You crawled in, turned over, and went straight to sleep. Success! And last night was problem-free too. This morning, though, through the fog of being dragged from sleep, I heard, “Mom! Dad! The light is green!” I squinted at my alarm clock to confirm; your OK-to-wake clock is programmed to turn on at 7:45 a.m. Yup, right on schedule. Then I heard your door open and your little feet slapping the wood floor. Hmmmm. That was not what we’d discussed. Your footsteps stopped, and I heard you say, “Oh! Hi, Obie!” (Apparently, our big blond furbaby was staring up at you from the other side of the barricade we set up at the top of the stairs, not to keep you in but to keep him out.) Then pitter-pat to just outside of our room and then the door handle jiggling. And finally, the door flew open. My eyes still weren’t open. I had to remind you, once I was up and awake, that you’re not allowed to leave your room until we come to get you, not even when your clock turns green. “But Marshall said it was OK,” you said. “Marshall is a cartoon dog,” I responded, “and he doesn’t make the rules. Mamma and Daddy make the rules.” I explained that leaving your room without us could be dangerous. “Well, Marshall was impressed,” you said. I was still too groggy to wrap my head around the exchange we’d just had, let alone ask exactly what Marshall was impressed by. “Impressed!” You’re something. At nap time today, you had a hard time settling, and I found you sitting up on the edge of your bed, playing with your stuffed animals . I had to come in to reminde you that it was nap time, not play time, even if it’s now easier for you to get out of your bed to play. I had to rock you to sleep. But once you were down, you slept for almost three hours. And when you finally woke up, we went to the playground with Nonna and Opa. You wanted to walk there like a big boy, not ride in the stroller. I brought the stroller along just in case you changed your mind, but you made it there (and back) without once wanting to climb in. At the playground, you launched yourself down the gentle hill from the jungle gym area into the wide, grassy field below, arms flung out to the side and behind you. You ran in a wide arc and then made your way back up the hill. You did this a couple of times before I asked what you were doing. “Playing airplane,” you responded, matter-of-factly. 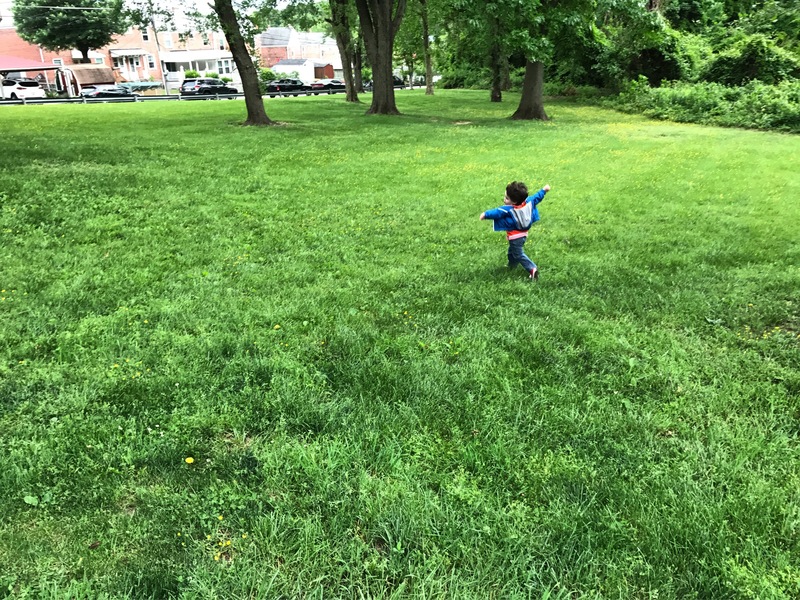 We stood at the top of the hill, watching you propel yourself down with your arms out and your head back, racing through the field sprinkled with bright-yellow buttercups, so fiercely independent and just so adorable. And I’m fairly certain this is my favorite age: when you’re a big boy but still so little in so many ways.